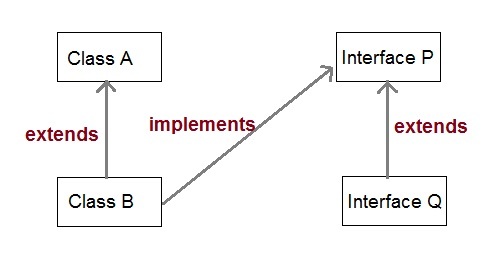 Inheritance is one of the key features of Object Oriented Programming. 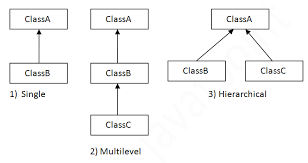 Inheritance provided mechanism that allowed a class to inherit property of another class. When a Class extends another class it inherits all non-private members including fields and methods. Inheritance in Java can be best understood in terms of Parent and Child relationship, also known as Super class(Parent) and Sub class(child) in Java language. 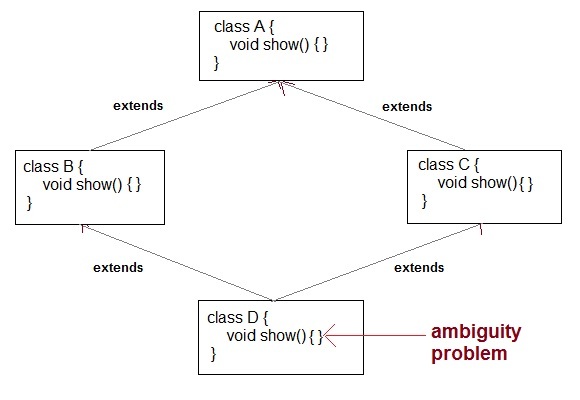 Inheritance defines is-a relationship between a Super class and its Sub class. extends and implements keywords are used to describe inheritance in Java. Let us see how extends keyword is used to achieve Inheritance. .......   //extends the property of vehicle class. Vehicle is super class of Car. Car is sub class of Vehicle. It promotes the code reusabilty i.e the same methods and variables which are defined in a parent/super/base class can be used in the child/sub/derived class. It promotes polymorphism by allowing method overriding. Main disadvantage of using inheritance is that the two classes (parent and child class) gets tightly coupled. This means that if we change code of parent class, it will affect to all the child classes which is inheriting/deriving the parent class, and hence, it cannot be independent of each other. To provide more maintainable and clear design. 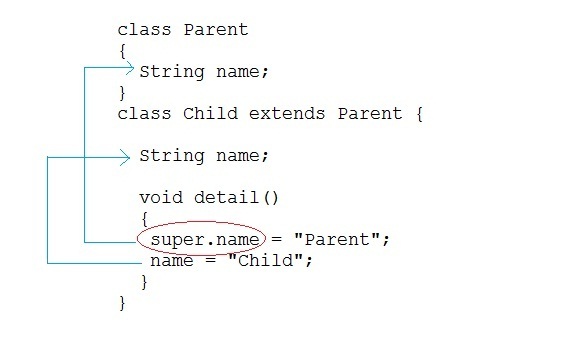 In Java, super keyword is used to refer to immediate parent class of a child class. In other words super keyword is used by a subclass whenever it need to refer to its immediate super class. Note: When calling the parent class constructor from the child class using super keyword, super keyword should always be the first line in the method/constructor of the child class. Super class reference pointing to Sub class object. In context to above example where Class B extends class A.
is legal syntax because of IS-A relationship is there between class A and Class B.
Q. Can you use both this() and super() in a Constructor? NO, because both super() and this() must be first statement inside a constructor. Hence we cannot use them together.